It's here! 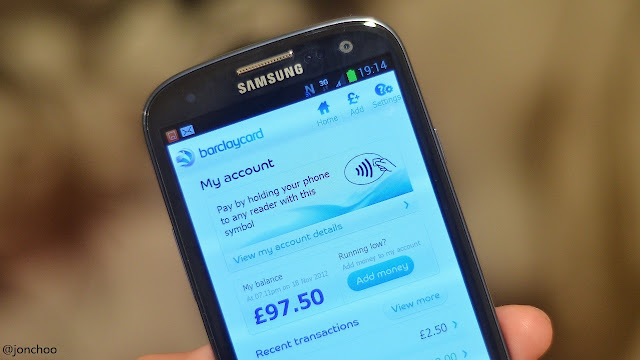 As part of the Gemalto Contactless Challenge, a Samsung Galaxy S III was delivered to me yesterday preloaded with a Barclaycard app, and some spare cash. From today, for a week and a half, me and Ewan of Mobile Industry Review will be competing against each other in a series of challenges. These challenges includes going through a whole day entirely on contactless, taking the Thames Clipper, buying flowers for the other half using NFC and visiting the Museum of London. We will also have to do a single challenge issued by our readers, so if you feel like sending us on a crazy quest, don't feel shy and let Gemalto know. So, is wireless payment technology ready to take off in London? I guess we will find out soon enough. In the meantime, I will be providing updates on this blog as well as tweeting our conquests using the #GemaltoNFC hashtag on twitter.